EDGECAM Part Modeler is a cost effective, 3D modeling tool specifically designed for quick and simple construction and/ or modification of solid models. Part Modeler comes complete with fully associative drafting capability. It’s the perfect complement to EDGECAM Solid Machinist – providing advanced modelling tools to create parts or workholding systems such as chuck jaws or fixtures. The major features of a machine tool can also be modeled, for accurate cutting simulation and collision detection within EDGECAM. 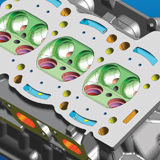 With the ability to execute a series of logically grouped construction operations as a single keystroke, EDGECAM Part Modeler enables rules to be applied simultaneously across multiple parts of an assembly with automatic part-to-part compatibility. Full associativity is maintained across 2D and 3D drafting; isometric, plan and orthogonal views; standard and ordinate dimensioning; and geometric tolerancing. 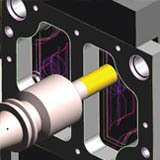 Tighter integration between engineering and manufacturing paves the way to increased productivity.